Canada’s Confederation happened in 1867. Why then? Historians have sometimes suggested that fear about the Americans starting to move north once their Civil War ended in 1865, might be the reason. It has also been argued that the Americans allowed individuals to work out their own law and order, while the Canadian government set up a police force (later called the Canadian Mounties) to oversee settlement of the country. 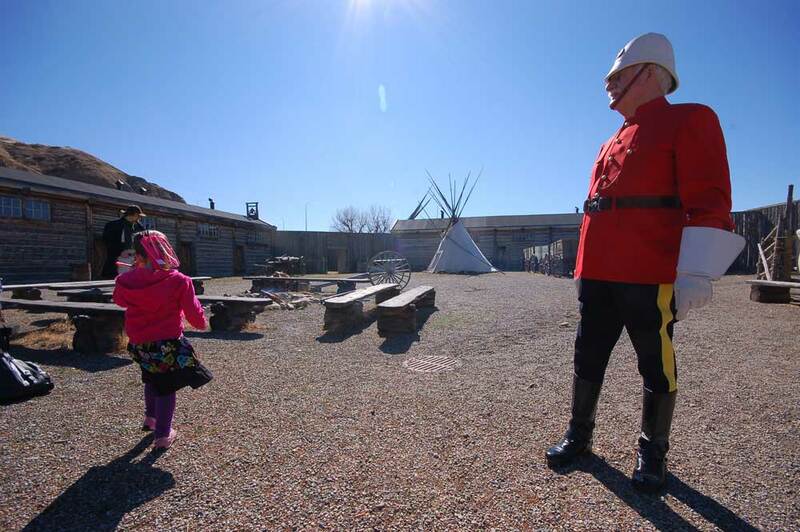 In September, 1873, the first police officers were appointed by John A. Macdonald’s government, and in October the first group of recruits left for Lower Fort Garry. Only two of these men had ever been policemen before, but during the winter at Lower Fort Garry they were very vigorously trained by Sargeant-Major Sam Steele, a tough, no-nonsense kind of man, who was to become famous in Mountie history. His orders were that the training of the men and horses would happen every day as long as the temperature remained above minus 36 degrees Farenheit. What an introduction to the climate of the great central plains! 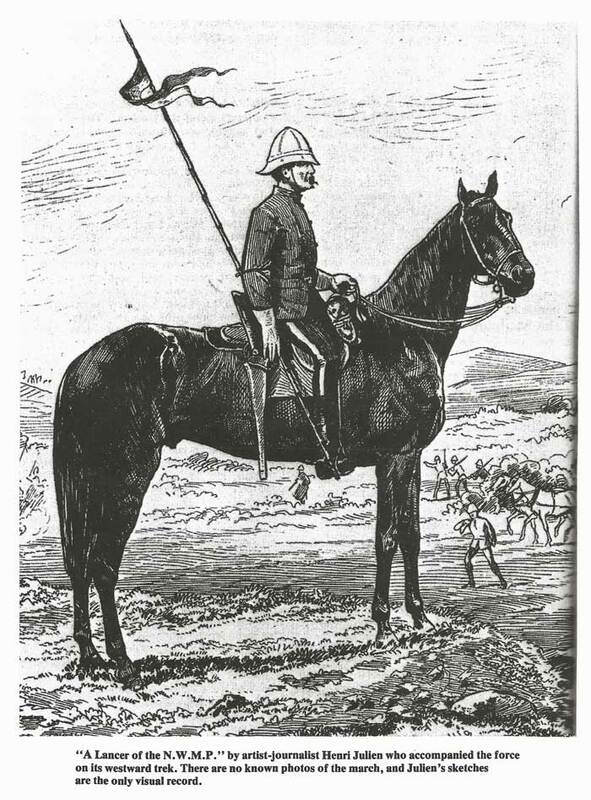 This new police force came to be called the North-West Mounted Police, and among it were some interesting characters. Joseph Francis had fought in the Crimean War and had taken part in the fateful British Charge of the Light Brigade and Sub-Inspector F.J. Dickens was the son of the well-known Victorian novelist, Charles Dickens, author of the story of Scrooge in “The Christmas Carol”. The youngest soldier was Fred Bagley, the 15-year-old trumpeter, who went on to serve as a Mountie for the next twenty-five years. The leader of this group was Commissioner George A. French. French resigned in 1876 frustrated by many quarrels with politicians who would balk at paying his men their 75 cents per day wages or granting them 160-acres of land promised to those who finished their service. On July 8, 1874, the new NWMP force of 275 men assembled in Manitoba near the border of what was then Dakota Territory, to begin their first march west. Part of their mission, according to Governor-General Lord Dufferin, was “capturing a band of desparados who had established themselves in some fortified posts in our territory in the neighbourhood of the Belly River.” This was a reference to numbers of truly “wild” Western Americans, who had, since the end of the Civil War, built several trading posts whose major source of income was selling whiskey and other alcohol to the native people. Fort Whoop-Up, in what is now Alberta, was rumoured to be the biggest of these whiskey forts. Well, the trip was no picnic in a hot prairie summer. There are no photo records, but a journalist-artist, Henri Julien, accompanied the westward trek and some of his sketches help tell a fascinating story. The first problem was a lack of maps, so Commissioner French was not always sure of his route. 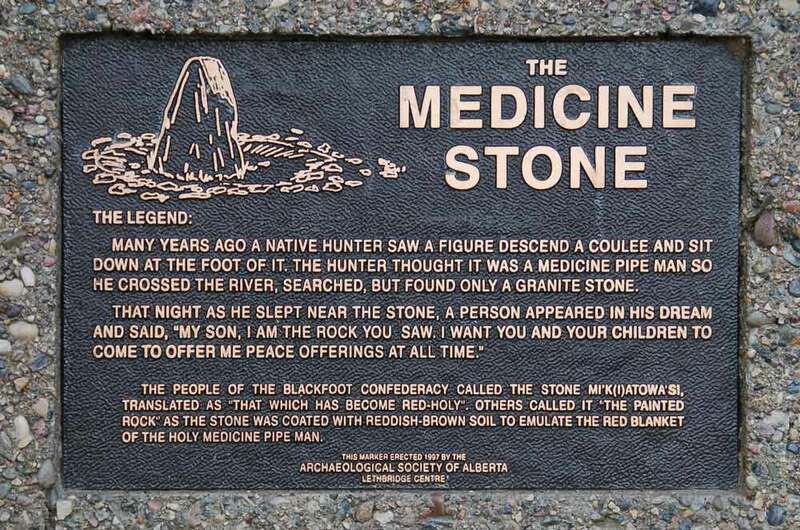 This improved in late September, when he hired Jerry Potts, a man of Scots and Blood Indian heritage, whose life as a frontier guide was a story in itself. 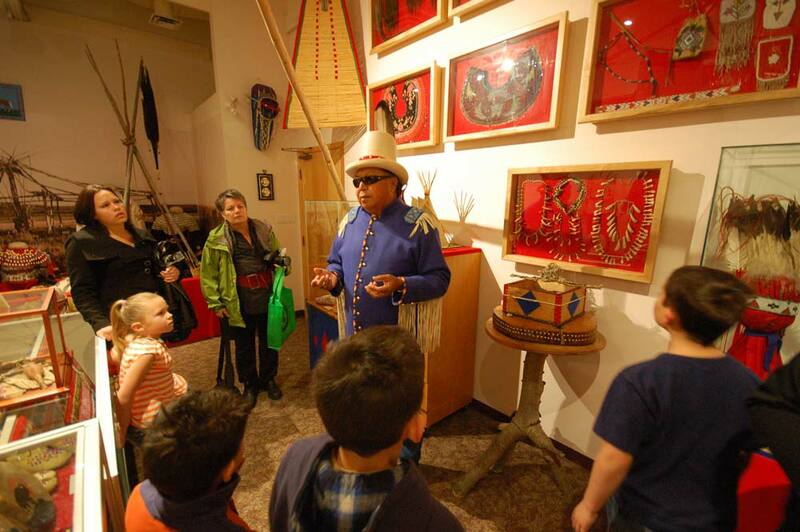 We can find a Jerry Potts exhibit at the Glenbow Museum in Calgary. 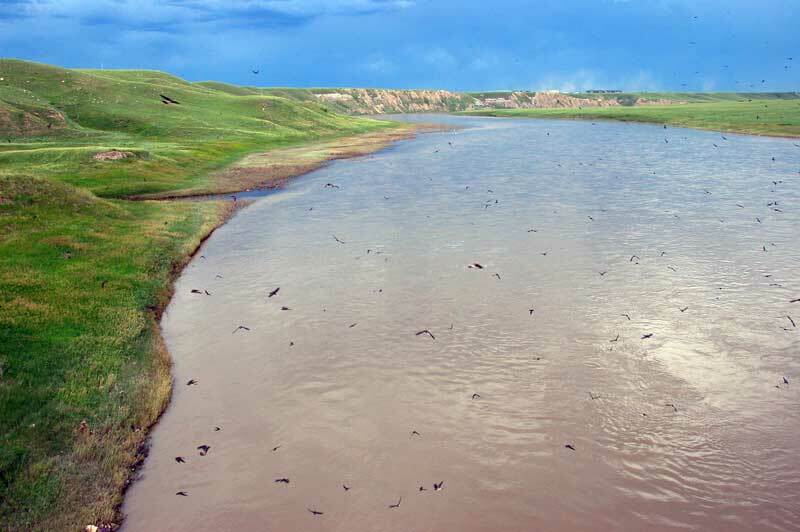 Another problem was the lack of water on the prairies. If it rained, notes from the journey describe an opportunity to get water ‘by digging in mud”. Many of the “lakes” they found were puddles of buffalo urine. Other notes left behind tell us that tea made from leaves steeped in boiled buffalo urine tasted terrible! The advantage of their discovery of the buffalo was that eating buffalo meat helped keep the men and horses alive, although at times they were all very short of food. Hot weather wasn’t the only problem though. 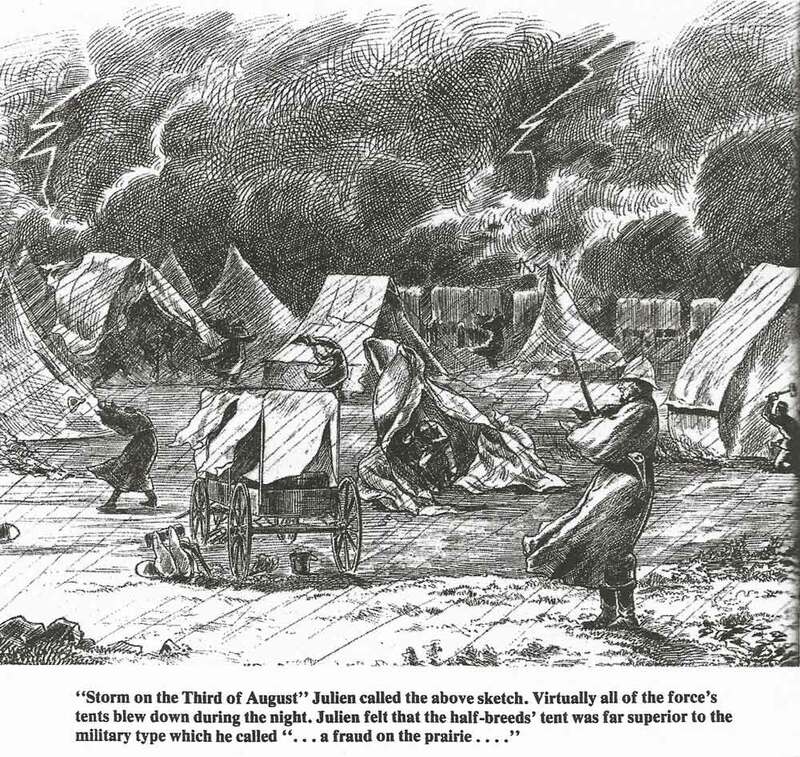 On August 3, a severe storm blew down all of the force’s tents. Julien, the artist, commented that the “half-breeds” had much better tents than the police. Likely they knew a lot more about the local conditions. Another problem which we can laugh at in our modern era was the mosquitos. One man wrote that “If you open your mouth to curse at them, they troop into it. …They sent a dog off howling in pain. 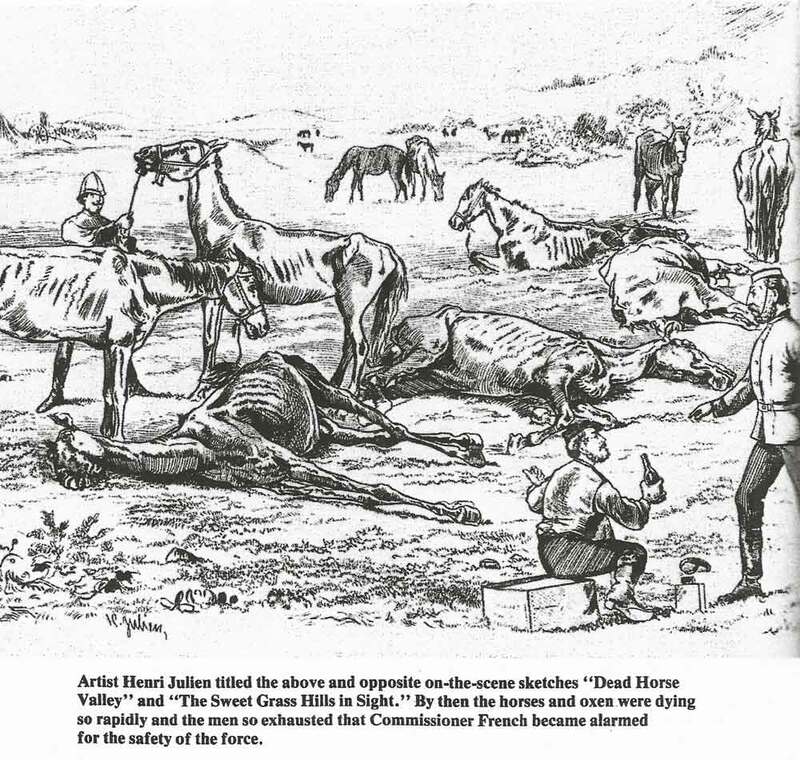 They tease horses to desperation.” The serious damage to men and horses caused by mosquitos is very evident in some of Henri Julien’s sketches in the RCMP Heritage Centre, the excellent Mountie museum in Regina. 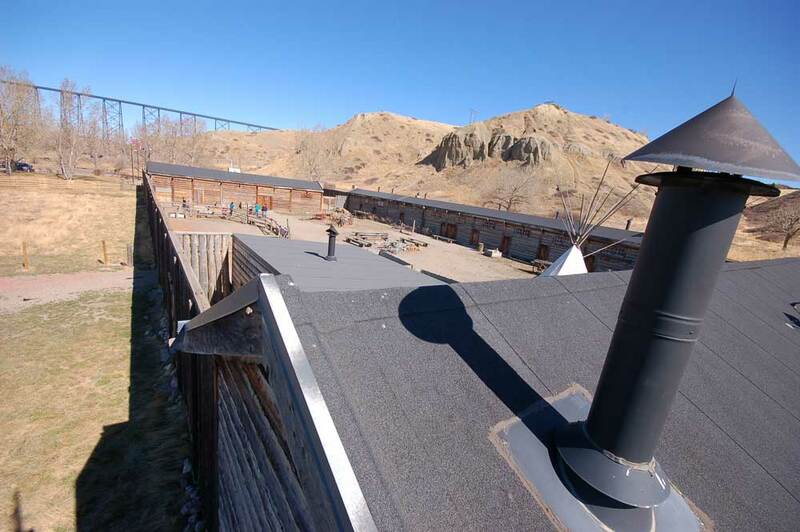 With the help of Jerry Potts, the troop finally reached Fort Whoop-Up on October 9. It can be counted as a moment when law and order reached the Canadian prairies. Earlier Jerry Potts had told Assistant Commissioner Macleod that the whiskey traders were not interested in taking the risk of meeting police, and when Potts and Macleod marched the men into Fort Whoop-Up, there was only one American left and he invited them in without firing a shot. During the winter of 1874-75, the men built Fort Macleod on the Oldman River in Alberta, the first permanent headquarters for the NWMP. But even before they finished building the fort, Macleod reported in late October that the force had arrested several whiskey traders and confiscated two wagon loads of their supplies. The traders were fined and released, which was probably fortunate, since the new force was busy starting to build Fort Macleod, and had decided to start with horse stables and log cabins for the men, so there were no jail cells to put prisoners in yet. Before winter was over, they made several more arrests, including a trek though a prairie blizzard, again with the help of Jerry Potts. By the spring of 1875, the whiskey trade was on the decline. Further evidence of the establishment of the rule of law can be see in the fate of Dave Akers, the man who had greeted the first arrivals at Fort Whoop-Up. In 1894, Tom Purcell, his former partner, shot him dead. The NWMP arrested Purcell, and he was tried for murder: he pleaded self-defence and was jailed instead of hanged. 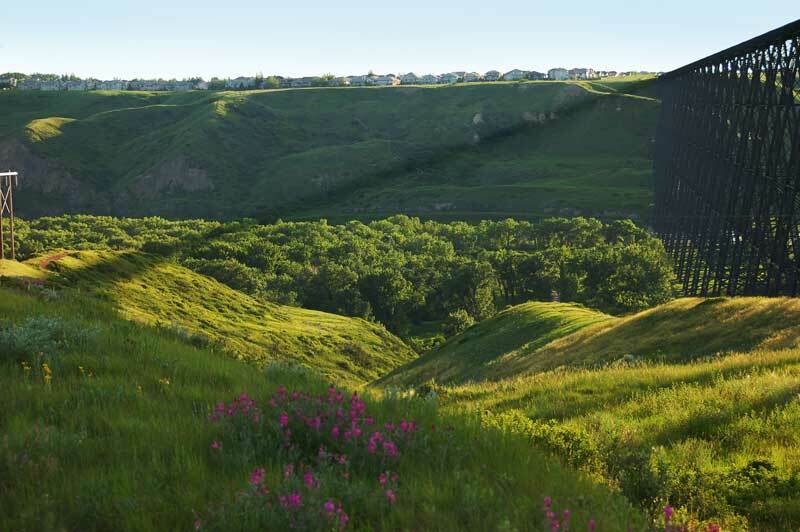 The force continued to have a serious presence as settlers moved into the prairies and relationships between white, Indian and Metis people weren’t always smooth. 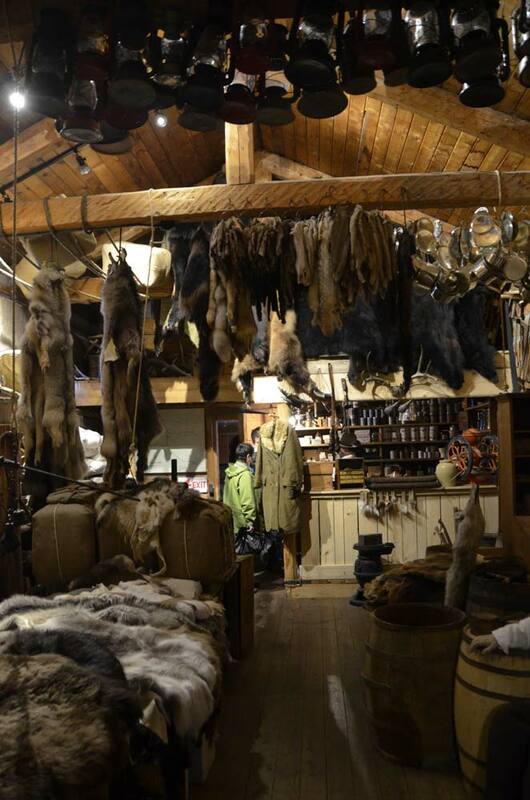 The Klondike gold rush at the end of the 19th century gave the NWMP an important role in establishing law and order. By February 1, 1920 legislation took effect incorporating the NWMP into a new cross-Canada organization called the Royal Canadian Mounted Police. The headquarters of the RCMP was moved from Regina to the federal capital, Ottawa. However, today Regina remains an important Mountie location. The “Deport” Division there is where training takes place, and where the excellent museum is located.